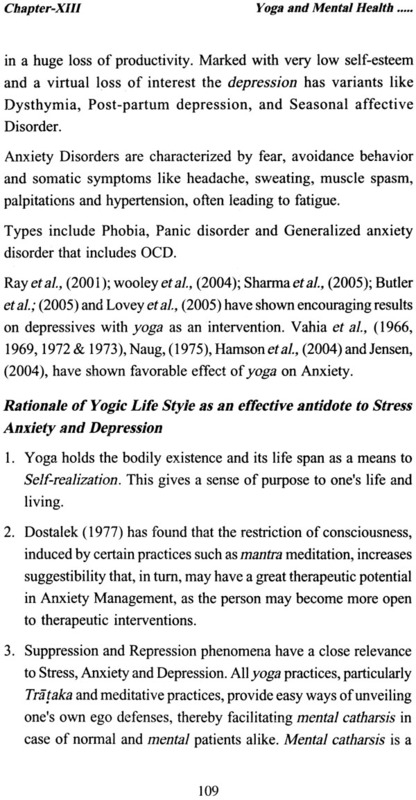 Mental health through Yogic Methods: towards unfolding our, potentials for a better Self Management & Self Evolution. 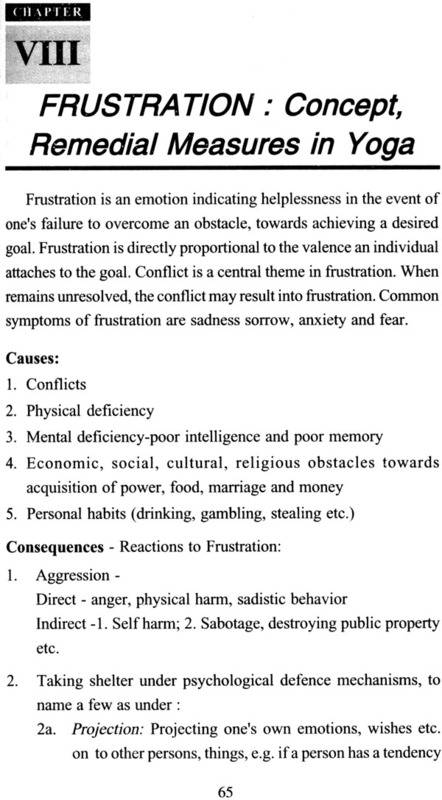 Pratical Stress management through Yoga: in tackling Stress, Anxiety, Depression & other Existential Disorders. 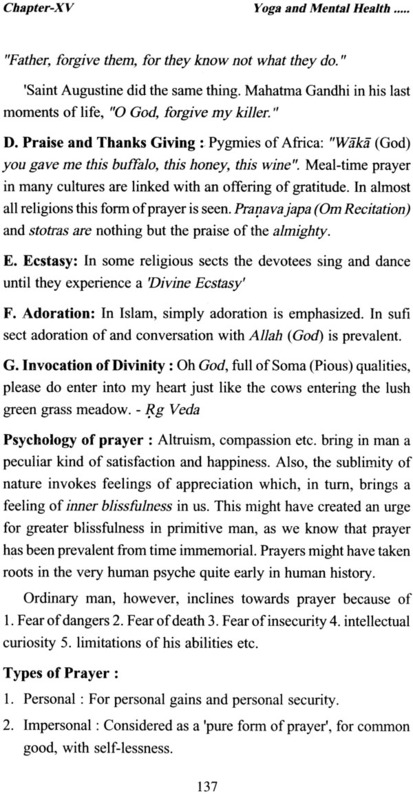 Practical Yoga Meditation & Prayer: on Scientific lines towards managing our personality & Environment, here and now! A rank holder at M.A. (Entire Psychology) in 1986 and NET (Industrial Psychology) qualified in 1988, Prin. Bhogal has been a recipient of National Merit Scholarship for his P.G. studies. He is winner of the prestigious shivram Apte prize for Sanskrit in 1984 from Fergusson College, Pune. He has over 25 experimental research papers and 40 other scientific articles to his credit. His book “Psycho-Physiology of Traditional Yoga” has been published in Korean language. A Book,”Anatomic & Physiological perspectives of Yoga” co-authored by him, being published by Kaivalyadhama, Lonavla, shortly. His monograph,”Role of Yoga in Mental health” is being published by WHO, shortly. He teaches “Yoga and Mental health” and “Psychological bases of therapeutic Yoga” for various courses at kaivalyadhama and at the University of Pune. 17 years of experience in psycho-physiological research into Yoga, in the capacity of Research officer (Psychology), and 20 years of experience in teaching Yoga psychology at kaivalyadhama, make Prin. Bhogal one of the Most sought-after speakers on Yoga Psychology. Widely travelled in Germany, Italy, Spaain, Thailand, Korea and the U.S.A. as a yoga expert, he has been a resource person to MIDNIY, ICMR, JIPMER and Free University of Berlin to name only a new reputed institutions. He has worked in the capacity of Managing Editor, Yoga Mimamsa ( A research quarterly, devoted to scientific and philosophic-literary research in yoga) for over a decade. At present, he is Associate Editor of Yoga Mimamsa. He has developed a research-based Yoga Meditation technique,”Holistic Meditation” that has been highlighted as “One of the nine major techniques of meditation today”, by the leading ;Mind-Body –spirit magazine “life positive”, New Delhi, in its April, 1996 issue. This technique has, also, been endorsed by Times Music (Times of Inda, Sept. 2,2003). Swam Kuvalayanandaji had a long-cherished wish to develop psycho-physiology of yoga, so as to encompass "spirituality" into it, on scientific lines. A couple of articles on yoga meditation, penned down by him, express this wish tacitly. Due to his untimely maha nirvana he could not fulfill this wish. As he has handed over his great legacy to us, the samiti's research workers have continued that quest to this date. Psychology has been the discipline, most dear to his heart, which he thought could stimulate us to delve deep into the spiritual phenomenon. Psychology section of our Scientific Research Department had put-up great efforts into fulfilling Swamji's wish. The progress, of course, is slow yet steady. 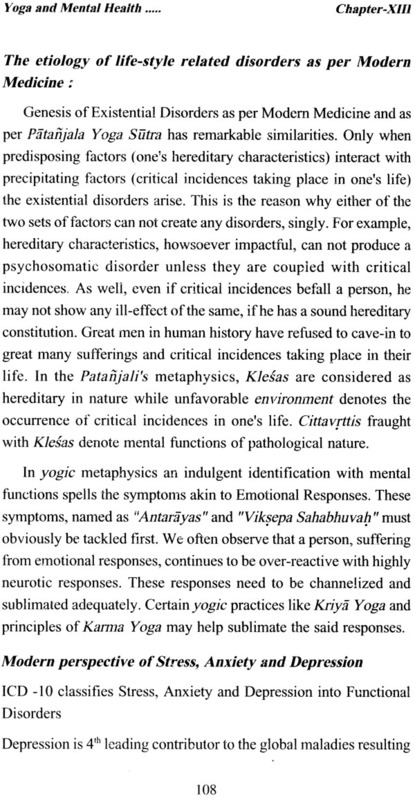 Our research workers of Psychology section have attempted varied problems like purification of the internal world through Trataka, exploring the problems like, "What makes a yogic personality? Of late, Omkara and Dhyana have been the areas extensively studied at this section. Apart from the scientific research at the kaivalyadhama laboratory and an in-depth theoretical exposition of yogic texts at the Philosophico-Literary Research Department, our teachers at Gordhandas Seksaria College of Yoga & Cultural Synthesis have always exhibited their best in teaching theoretical aspects of yoga. 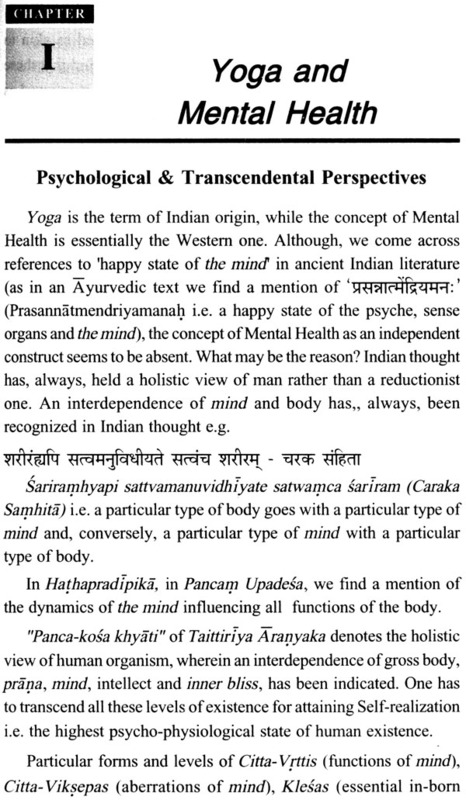 As the Kaivalyadhama academia has expanded leaps and bounds, there has been a great need of a good book on Yoga and Mental Health. Principal R.S. Bhogal has done a great job in writing the book "Yoga & Mental Health & Beyond". A long standing experience as Research Officer, Psychology, and almost two decades of teaching experience reflect amply in this book. I am sure the academic world would welcome this work whole heartedly! I pray the almighty to shower His divine blessings on the author. There can not be a greater tribute to Swamiji than offering such a quality book in the service of the academic world ! It so happened that a certain student stood in one of the lectures of this author, "Sir, how can psychology and yoga be correlated mutually. Both being so different, how can we even compare them with one another?" Well, this was a challenge, albeit gentle! Immediately, I was reminded of Swam I Kuvalayanandaji's quote asserting that yoga is chiefly mental and spiritual. Well, good questions are like a tonic and a stimulant to a teacher. If yoga is chiefly mental and spiritual then psychology should be an appropriate medium to understand its nuances and subtleties! Alas! Psychology does not, formally, recognize the existence of 'an elusive entity' called Mind. How can it study the spiritual phenomenon of yoga? Thanks to the student, this author continued his attempt to give a serious thought to such queries at the Kaivalyadhama College. His predecessors Dr. H.C. Kocher, Dr. V. Pratap and Prof. R. J. Sahu had contributed, commendably, to the subject of Yoga and Mental Health. Now, it was left to this author to help evolve it further. Now, the new question, added to many an unresolved one, was "Can there be a health of the mind" ? In Indian thought the mind is considered as a part of Citta, entrusted with the responsibility of conceiving, reflecting and contemplating, without deciding the propriety or otherwise of such an endeavor! So also, yoga accepts the importance of the mind i.e. manas in the pursuit of Yoga Sadhana, in that it is the mind only that can be invested into our consciousness endeavors in yoga practice! Now, the problem was compounded further with etymological difficulties like, whether the mind can be comparable to manas? Is yoga limited to achieving Mental Health? In yoga, the mind should become subservient to the dictates of the atma tattva, if we aspire to be remain an integrated being even in the phenomenal world It was thus revealed to the author that yoga endows us with much more than merely a mento-emotional stability. Therefore the title of this book was finalized as Yoga & Mental Health and Beyond. Indeed, the hidden part of the iceberg of yoga is yet to be explored fully as Or Nagaraj, V.C. of NIMHANS, declared at National Seminar, in 2007, that yoga, being as old as 8000 years, cannot be compared with the modern sciences which are barely 300 hundred years old. However, in the same breath Dr. Nagaraj cautioned, "We have not known yoga sufficiently as yet; much remains to be explored & researched." This book is a humble attempt to explore the application of yoga to human life and living. 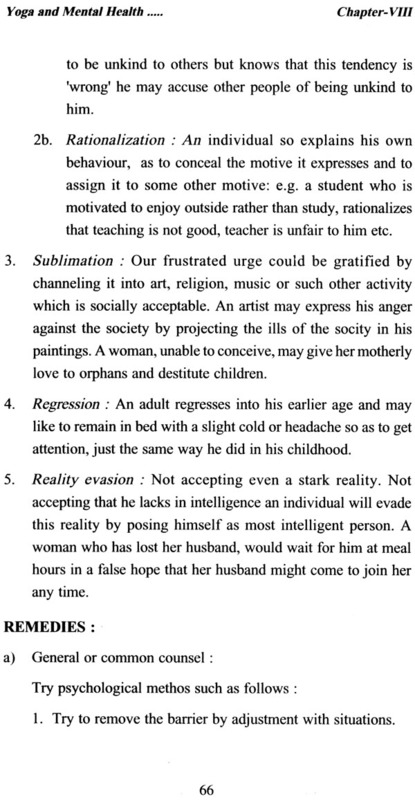 The medium, used in this attempt being the science of psychology the author has to remain merely-a-presenter of facts rather than being a party to any of the prevalent schools of thought, as we have a great legacy of Swami Kuvalayananda to view the science behind the ancient yogic lore, with all our sincerity and earnestness. The scheme of the book is as follows: Section I comprise the discussion relating Psycho-physiological and Metaphysical perspectives of yoga. Section II discusses Developmental Therapeutic applications of yoga. 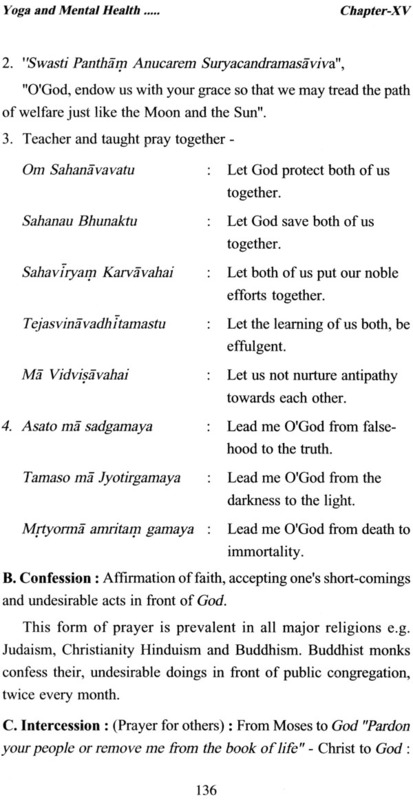 However, chapter 3 show 'necessary overlap' with Part I as regards Omkara & Dhyana. The author is hopeful that his attempt would contribute, at least to some extent, to an objective and pragmatic understanding of yoga practice and Yoga Darsana. It is hoped this book will stimulate the discerning minds who would come forward with their feedback to enable the author to integrate the same into its second edition, with all his humility and gratitude.